Painter Prudence Flint has been named the winner of the 2010 Portia Geach Memorial Award for her work Scrambled egg. The award is open to female Australian artists and is restricted to portraits. The People’s Choice for 2010 was awarded to Danelle Bergstrom, Independent Spirit (pictured left), a portrait of artist Ann Thomson. 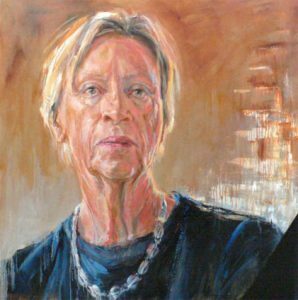 This is the fourth time Bergstrom has won the People’s Choice prize at the Portia Geach Memorial Award, with previous wins for portraits of Nancy Borlase (2006), Inspector Michael Hobbs (2005) and composer Peter Sculthorpe (2009).